Aaj Shoshthi. The Sixth day of Navratri and the beginning of Durga Puja. Strangely this Pujo, I do not miss home much. And I should have. Even AnandaMela or Desh does not excite me much this year. I did not even book an online copy. Anyway it is only "Sirshendu" and "Bani Basu" that is worth a read, maybe I will borrow later I say to myself. Instead I pine for a lost childhood, a childhood resplendent with glamor, light, excitement and happiness of Pujo. I miss the fervor, the excitement which would begin early with the colorful print ad of the annual Pujo Shankhya AnandoMela and would go on late after Lakshmi Pujo lingering on till Diwali. I miss the last minute packing, the new clothes, the bite of my new black ballerina, the jostling crowd, the blaring sounds, the pujo-pujo gondho... Or maybe I don't.I sometimes think I have just glamorized the whole thing and put layers of brighter colors over a faded sepia print. But I cannot deny the excitement, the wait, waiting for Pujo. I try to enjoy Pujo here, for sake of myself, for my daughters. To let them know where their parents came from, where their roots lie. I buy them new clothes, I save clothes bought at "Back to school" sale to be worn during Pujo. It doesn't really matter much, clothes and shoes are necessities bought year round, new clothes for them does not herald Pujo. We try go to the mandap(the place where Durga Pujo is being held) almost every day, back from work we deck up in finest silks and chiffon and are at the mandap late for the anjali but in time for dinner. The dhup-dhuno, the flowers, the Mother's glistening face enchants the little ones, they play round the mandap with their friends like we did. If it is an extremely busy day like today we visit the Krishna Temple nearby instead. There Navratri celebrations are at a crescendo and in midst of Lalita Sahasranama chants I feel contented. Back home we string up twinkling Christmas lights on the porch, pick flowers to offer to the tiny idols sitting on my Puja shelf and light a lamp. I cannot pass on to my daughters the pleasure of waiting for all those months for Durga Pujo, they will not know the excitement that Pujo can bring but I can redefine Pujo for them and that is what I do. Maybe in the process I also redefine home. Maybe I am home this pujo. And in my own way I make some sweets for Shoshthi. 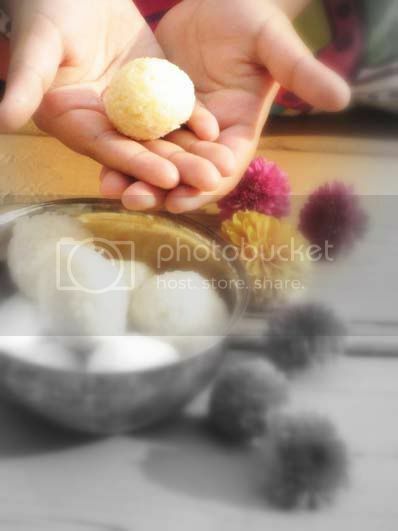 These were sweets which were actually made at Dashami, after the immersion, to sweeten lives and memories. These were Narkel Narus, two kinds. Gure'r Naru, the ones made with jaggery, deep brown in shade and Chini'r Naru, the pristine white ones made of sugar. I never like the gur'er naru much, with a little incompetence on the cook's side, these would be as hard as marbles. I preferred the white chini'r naru and this is what I make, late in the night after everyone goes to bed. I cannot afford to grate a coconut, I have no time and the frozen MTR brand works just as fine for me. Unlike my Ma who uses whole milk and reduces it painstakingly, I use condensed milk and evaporated milk, cuts my cooking time by half. Rituals need not be so hard that we loathe & forget them, it is better to find easier means to enjoy them instead. I am done in time for bed and an early start tomorrow. And yet I have a batch of narus which I will take as offerings to the goddess tomorrow. 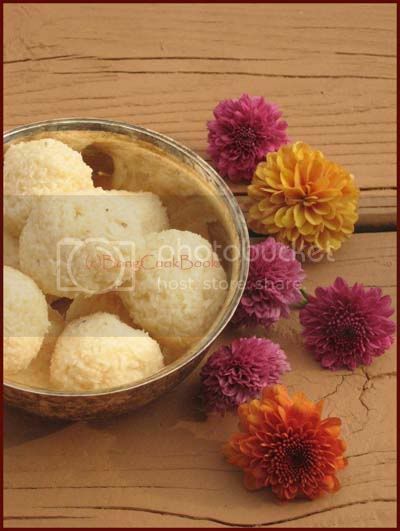 Narus, sweet, decadent and delicious, the perfect beginning to 5 days of Durga Pujo. Edited to Add: And though it took me more than 30 mins to make these, it shouldn't have. I am slow and I kept the heat at low-medium, which stupid cook keeps heat at low to medium when they are cooking for a party. The better ones can do this under 30 and so these Narkel Narus join the Express Indian Party @ Anita's. I am also sending the first pic to Heirloom:CLICK. The recipe is age old, the shortcuts are not. Store in an air tight container. I usually refrigerate but my Ma used to keep it out. Sandeepa, Happy Durga pujo!! :) I fondly remember the durga pujo held in my college every year by the bong folks. But this post of yours... ah .. it bought back soo many memories, that I cannot express it in words. Just read Sunita's pooja post and again yours. These memories of childhood never goes from us and there is always some sadness attached when thinking of our children. New dresses are part of festivals for us but not for the kids now. So goes with the sweets and savories made days before the festivals. I am trying much to preserve them as past 2 years myself and siser were making 3-4 sweets amd 2-3 savories for Diwali. Thanks to blogging world to kindle that ineterest. 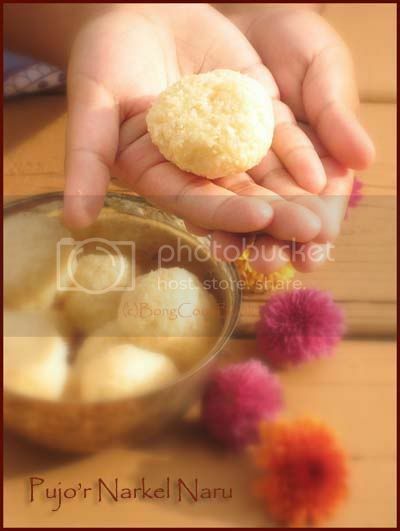 I shallbookmark thse prestine laddoos for Diwali :) thanks Sandeepa and Durga Pooja wishes to u and your family! pujor shubecha ar priti..narkel naru khob bhalo hoyeche...may be baire thakhte-2,ekhon otae tumaar ghor hoye geche ..kinto ekta choto kono mon aaj o deshe pore ache ,tai na? Yeah i too miss the celebration we had when we were kids too. I just think they dodn't have the same kind of celebrations we had back then. I know exactly what you mean, it is the pink tinted visions of our childhood during festival times and missing it on our kids' behalf. The coconut sweet looks pure and pristine. Happy Durga Pooja, San! Laddoos look delicious and simple to make too. I'm not much into rituals but now for M, I actually did an elaborate pooja on Gowri-Ganesh festival. She really enjoyed that. Ki shundor likhecho.. i feel very nostalgic every year; esp. the pujo pujo gondho, shiuli fool gacher nichey bichiye thaka, bhor bela dhaaker awaj.. kothaye jeno hariye gelo;-( we don't do anything here, even with the kids & it is a shame i know. very easy naru recipe. ebar amake naru banatei hobe. A lovely post. I used to love going to puja as a child, but here I feel cut off from the things that made puja something to look forward to all year. Shasthi is my janmatithi (hence the name), so its sad to feel so removed from it. Anyway, thank you for the recipe aar pujor subecha. My greetings to Durga Pooja! We follow closely all the festivals here but my kid is always interested in halloween, Xmas gifts, etc... If i ask about Diwali, is simply sweet! I am so happy you brought some of the festivities of Durga Pujo over! Truly, better to keep tradition with shortcuts than to not! New traditions that build on old ones. Sandeepa - Tomar ei post ta touched my heart. It is like keo moner kotha ta bolchay. I too do it all here so that my daughter know her bit about my roots. Also, thanks for the idea of making a naru. My mother would make from grated fresh coconut but she did put the condensed milk and omitted the sugar. In the end she would sprinkle some small cardamom seeds and that would go quite well with the coconut. You reminded me, I did put some coarsely grounded cardamom !!! Sharadiya Abhinandan Sandeepa . Like you I also think of lost pujos . My memories are mixed - the sad one overtakes all the happy ones I have had . But for the last so many years pujo has been good and this year even better. As I've said so often there's something about your cooking that reminds me of Ma - and the chyapta naru in the photograph is evocative of the ones she used to make for Dashami. Nice post, Sandeepa! Esp the part where you mentioned how rituals do not have to be so hard. 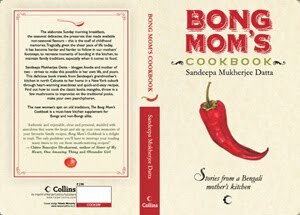 Desh does have Somoresh Majumdar and Sunil Gangopadhyay (short story) this time. Ar Sananda ye jeno dekhlam Nabanita Densen er ekta lekha ... byas. Notunder porte shotti utshaho pai na ... shei class seven theke S Ganguly porchi ... barite Desh regular chilo. Eder pore ki hobe tai bhabi Sandeepa. Do u say Happy durga pooja? I am unfamiliar with the terminology to greet u during the puja days!! "I sometimes think I have just glamorized the whole thing and put layers of brighter colors over a faded sepia print. ""that's exactly how i feel with some of my memories!! The new clothes is another thing that the kids take for granted!! there are new clothes thru out the year so no sentiments attached to them anymore! i so love this post of ur coz u have spoken exactly what was going thru my mind last week. Sandeepa tomra amader oujor bhajo basha o shubechha niyo. We will head out soon for ashtami'r pujo. Ah very well written post. You have summarised the feelings of what we missed there in India and what we have here, so beautifully. Happy Durga Pooja to you and your family and beautiful coconut laddos. Amee o tomar silent admirer. Kono din hi kuchu comment kore ni. But today's post forced me to comment. Amee pujo ta khoob hi miss korchi. Aajke ashtamir pujo te gelam aikhane, shudu ek din...one day to replace the excitement and glamor of pujo of 5 days that we witnessed growing up. Makes me want to run back to India and to those days of childhood. Tomake aar tomar porivar ke shubecha pujor. Glamourising the past! Don't we all do that? There is some charm in that too huh? I was almost going to attend durga pujo - the festivities nearest to my place but my daughter decided otherwise! Happy Dussera! happy durgo pujo :) i see wishes and pictures everywhere. so beautiful..
Durga Pooja wishes to you and your family! Sandy..lovely post! Your daughters will have their own special memories of Pujo - not the same as yours but special in their own way. That's what you are doing and they will look back with affection and nostalgia. I have just discovered the joy of Durga Puja since moving to Delhi (and living a km away from C R Park - that oasis of Bengal in Delhi). My daughter's best friend (and her mom is a close friend too) is Bengali and she loves dressing up and going Pandal hopping with her and enjoying all the mishti. I don't worry that she doesn't get to see the "golu" which she used to in Chennai - growing up in Mumbai I didn't either. Bijayar anek anek suvecha roilo tomai abong tomar paribarer janne. Shubho Bijoya. I have been following ur posts for past few months. Being far from home ur posts i really appreciate ur recipes. Thanks for posting narkel nadu recipe, it has always been my favourite sweet and i was planning to make it today(I know it is a bit too late but still...)The way u keep the site updated is commendable I am sure ir requires a lot of hard work. U have inspired me to start a blog of my own. Thanks once again. Just loved your post. Brought back all those childhood memories of pandal hopping during the pujas. Ma made me a box full of naru this time on my way back from India as I never made them here. But I will definitely try out your narkel naru recipe sometime soon! In our family, what you made, the white version with the "milk" & cardamom was known as ROSHKORA.Sometimes,a hint of edible camphor, if I remember correctly. Narkel Nadu was the BROWN version, grated coconut cooked with good quality, fragrant cane jaggery until nice and sticky. No other flavoring,as far as I remember, although the grater varied the texture of the gratings a bit, from coarse to fine, to allow for textural interest. A quick & easy way in the US for those who cannot access good jaggery is to use Goya frozen shredded coconut that is widely available and the Grandma Something (forget the name,Moses?) unsulphured molasses that comes in the bottle with a yellow label. Do not use Brer Rabbit Blackstrap or any of the stuff that has a green label on it. Just my taste, YMMMV. I find the cane jaggery sold in the US from Indian groceries, even the 11 lb blocks, a far cry from the rich, grainy product of my childhood. We used to make our own, but even the stuff sold in the market, in huge rounds, was simply superb. Shubho Bijoya to all. Pray that the 2 little ones grow up to a peaceful world and enjoy many happy Bijoyas among loved ones. I pray that they may know the joy of shefalika blossoms, gathered for anjali for Sandhi Puja. Narayana. I don't remember "Roshkora", we called them "Chinir naru" and "gurer naru". But the camphor I can smell, hated it absolutely :) Our family didn't use camphor in narus though but many of our extended family and friends did. i will look for the Garndma Molasses. My Mother made a part gur-part chinir naru this time with jaggery blocks from Indian store. Since I anyway like "chinir naru" better than "gurer naru", loved these mild gur ones. Shubho Bijoya to you and your family too. recipe ta akhon aar dekhachhe na--ota ki arek bar post kara jay ? recipe ta akhon aar dekhachhe na, ota ki arek bar post kara jay ? But where is the recipe ? SAME QUESTION - Where is the recipe? I know it was there since I used it once to make amazingly good narus.